I know what you’ve all been thinking, these past few years; where the hell are Crilly’s crazy cooking videos? We’ve had Nigella, we’ve had Joe Wicks, Jamie Oliver has released about thirty new cookbooks, but none of them are a patch on Ruth and her woefully under-prepped, badly-filmed recipe videos! Well here you go – feel free to thank me later. 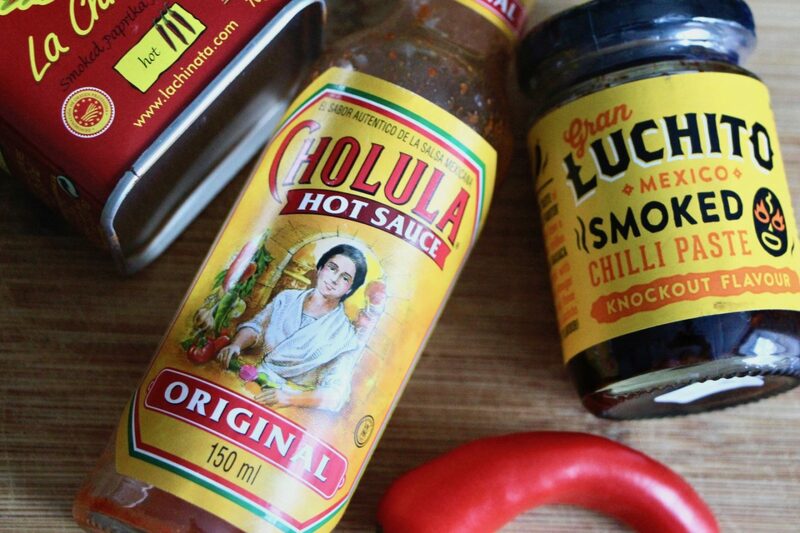 A meat-free chilli recipe that will warm the cockles and spice up your weekday mealtimes. 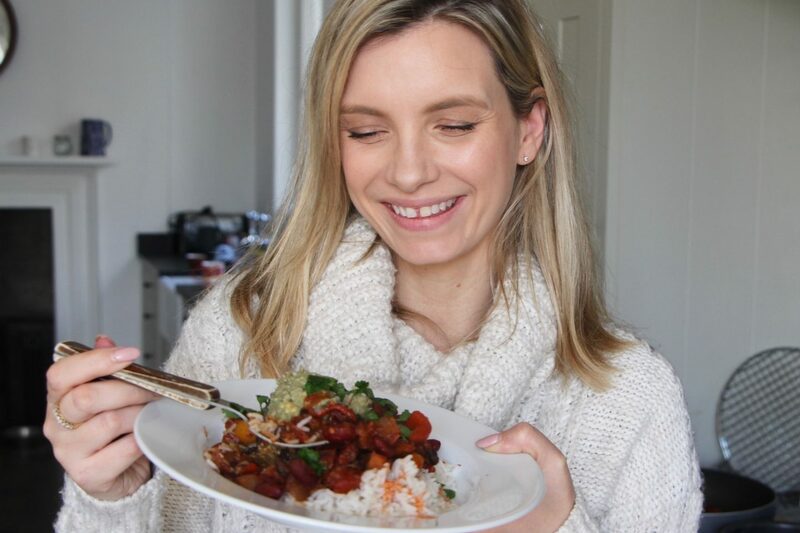 I’ve been meaning to share this one for a while, because it’s a very tasty vegan alternative to the classic, beefy Chilli Con Carne. 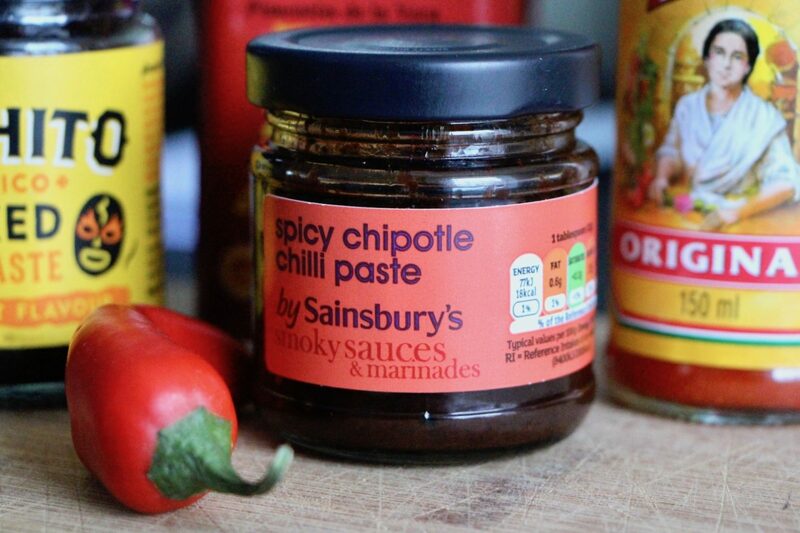 I usually find vegetable chilli so bland and boring but there’s a little jar of chipotle wondrousness that saves the day for this particular version. Quite honestly, I’d say that the chipotle paste is non-negotiable. I mean you can knob about with any sort of bean/vegetable combo you like – add in courgette, mushrooms, more beans, less beans – but the smokey richness from the chipotle is the very backbone of the recipe. I got mine in Sainsbury’s but a quick Google shows me that both Waitrose and Tesco also stock it. Now I’m not vegan, or even vegetarian, but I’ve never been massively into cooking meat at home and over the past few years I’ve reduced our meat intake even more. This vegan chilli recipe is quick, easy and makes a huge pot (even huger if you have the mushrooms and courgette in, which I forgot to buy) and you can portion it off once it’s cooked and then reheat whatever you need on other nights. It actually tastes better after a few days in the fridge and there’s nothing better than remembering you’ve got a tasty, ready-made meal waiting for you when you’re knackered and just want to watch Netflix. I’ve written out the ingredients list and recipe method (it’s so uncomplicated it almost seems patronising to write it out but hey, I’m here to serve!) and you can refer to those beneath the video. It drives me mad when I look up a recipe online and then I’m forced to watch a video to find out how to make something, so I’ve covered both bases. Enjoy. Excuse the jaunty camera angles and fact that the video seems to have been edited by a madman – I was home alone and operating two cameras on two tripods was trickier than anticipated! 1. Fry onions in vegetable (or other) oil until browned and almost caramelised. Mmmm. 2. Add the chopped pepper and chillis and fry until softened. 3. Add the dried spices and garlic, stir quickly and then add the chipotle paste. Have your tin of tomatoes ready to add in case the spices stick to the pan – you don’t want the garlic or spices to burn so keep stirring! Stir for about thirty seconds then add the toms and half a can of water. 4. At this point, I let the sauce cook for a few minutes whilst I drain my bean medley. Then add the beans to the sauce and allow to cook for anywhere between 20 minutes to an hour. If you keep it cooking along, check the water level and don’t let it dry out! 5. Mash your avocado, cook your rice (I use basmati, takes 10 mins to boil) and taste your chilli – at this point I add some ketchup if it needs zinging up a bit, and then salt to taste. 6. Serve it, eat it. I actually make mine REALLY spicy and have yoghurt with it but that wouldn’t very vegan so I left that fact out! It’s also great piled into taco shells or tortilla wraps with grated cheese/vegan cheese and sliced pickled jalapenos. Oh I absolutely loved it! Your expression on mentioning “nutritious” and “salad” were just hilarious. I gotta say though, I do love me some sweetcorn in any chili! I will definitely give this a try. By the way, you look absolutely lovely in this video! Your skin looks lovely and your hair is such a pretty honey shade! I made it today for dinner with courgette and mushrooms (and ketchup), turned up absolutely delicious!!! Even better than your lamb keema:) I really like your cooking style – simple, normal ingredients from normal shops and so yummy. Hope there will be more recipes coming. I am most certainly going to have to make this myself! I don’t cook lot of meat at home either, despite not being vegetarian or vegan. Good meat is expensive and needs cooking skills, and I am definitely not skilled in the kitchen. Brilliant post. More cooking please!! Totally agree with ‘avocado roulette’… I have given up buying them now because I get so disappointed every time!